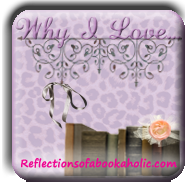 Weekly Meme, "Why I Love Wednesdays" is hosted by Alexis of Reflections of a Bookaholic. Each week she posts a Why I Love Topic that she answers. Check out Alexis' blog and join in the fun. I'm currently reading Divergent. I can totally see Dakota Fanning as Tris. I think she actually looks how I think Tris would look. I think she's a good actress and she could pull it off. Which actor/actress would you love to see as a character in your current read? Leave me a comment below!